Not getting stranded was probably your biggest driving concern this winter. Now that spring has rolled around and the sun has returned, chances are you’re seeing the toll nature took on your vehicle. Those who live in areas with heavy snowfall–especially those in the Midwest and East Coast– are familiar with road salts, which are sprayed on streets and highways by maintenance crews. While salts melt snow and clear roadways, they can also destroy paint and the undercarriage. Even if you’ve faithfully rinsed off your floor mats throughout the winter, chances are there are residual stains to address. An aggressive interior cleaner can help polish rubber mats to like-new condition, Deddo said. “Look for something that has similar power to a commercial cleaner,” Deddo said. Nationwide rock salt shortages have forced companies to mix their product with sand and mud to maintain costs, he said. The modified compounds still melt snow and improve traction, but the mixture can make vehicles appear filthy. Hosing the wheel well dislodges caked on crud, Deddo said. Salt is highly corrosive and Deddo suggests washing and waxing the wheels to protect against damaging deposits. Removing road salts from the paint requires a thorough washing–not just rinsing it off. 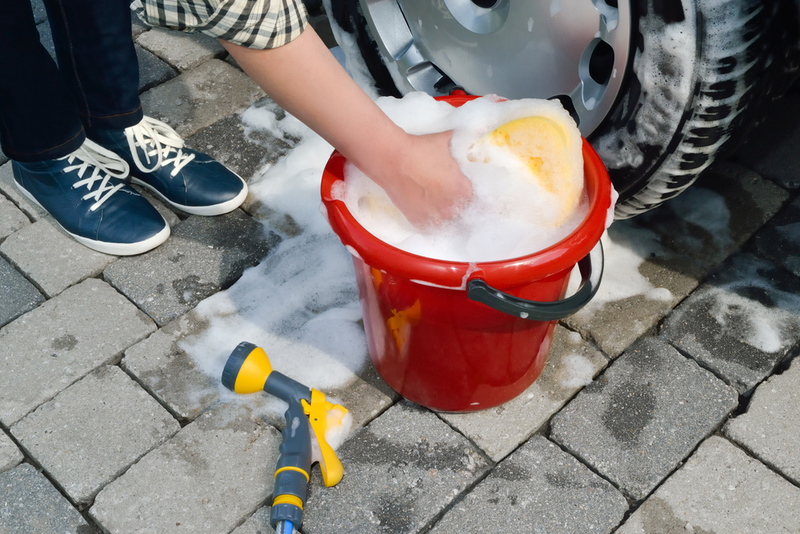 Deddo doubles or even triples the amount of auto soap in the wash bucket when removing salt and grime. You’ve taken care of the exterior, but what about the engine compartment? Spray and splatter from the road coats engine components. Peering beneath the hood doesn’t need to be intimidating, especially if you are just wiping down the engine, he said. “You can wipe the hoses and plastics down with a damp cloth. You could also use an interior cleaner if you wanted. After all, those are the same plastics and rubbers you find inside the car,” he said. Cleaning the upholstery, rinsing the wheel wells and removing grime from exterior surface will help protect your vehicle and return the luster. Thoroughly clean out your floor mats: If vinyl, use dish soap and warm water. Cloth mats require vacuuming and spot treatments or replacement. Clean the wheel wells with an automotive wheel cleaning solution. Salt and grime clings behind the tires and needs to be flushed out with water. Increase the concentration of soap in the wash bucket. It’s gentle, and you may find it easier to remove built-up grime. Clean under the hood. Wiping down the engine and hoses with a damp cloth makes the area look better and allows heat and air to move around in a cleaner environment.